We don't think you'll find a cake pan anywhere like this! These aluminum 9”x13” cake pans and 9”x 9” brownie pans have a high gloss enamel finish on their lids with beautiful full color imprinted images. 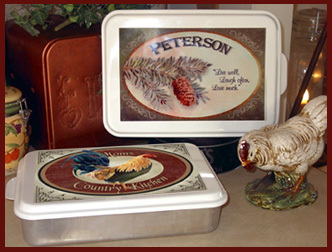 They make a great gift for any occasion, and are sure to be remembered. Choose from our assortment of one-of-a-kind designs, pick from our selection of phrases, and add the name you want printed on your pan.